The Supreme Court recently ruled that drugmakers’ alteration of an original medicine’s base to make generic copies was a patent infringement. The decision apparently dealt a major blow to local firms to use the base-altering strategy as a means of avoiding patents. However, four domestic pharmaceutical firms said they won limited exclusive rights to sell their generic copies of Pradaxa (dabigatran etexilate mesylate), an anticoagulant medication, for nine months without any competitors. The Ministry of Food and Drug Safety approved Huons, Aju Pharm, Intro Biopharma, and Jinyang Pharm to sell eight imitations of Pradaxa. The eight drugs include Huon’s Hubitran Cap. 110mg, 150mg, Aju Pharm’s Dabitran Cap. 110mg, 150mg, Intro Biopharma’s Dabican Cap. 110mg, 150mg, and Jinyang Pharm’s Pradabi Cap. 110mg, 150mg. Pradaxa’s patent on “substituted bicyclic heterocycle, its preparation method and the pharmaceutical composition containing it” expires on July 17, 2021. Another patent on “dosage form for oral administration of propionic acid ethyl ester” expires on March 3, 2023. The four companies can exclusively sell the eight generic drugs for nine months from July 18, 2021, to April 17, 2022. If the companies delay the release of their products until July 18, 2021, when base-altered drugs can arrive in the market, their generic copies could compete against base-altered medicines. Medications that won sales license through altering the base include Jeil Pharm’s Jtran Cap. 110mg, 150mg, Dasan Pharmaceutical’s Dabiall Cap. 110mg, 150mg, Yooyoung Pharmaceutical’s Yooradaxa Cap. 110mg, 150mg, Daewon Pharmaceutical’s Dabidaxa Cap. 110mg, 150mg, Samjin Pharm’s Dabiran Cap. 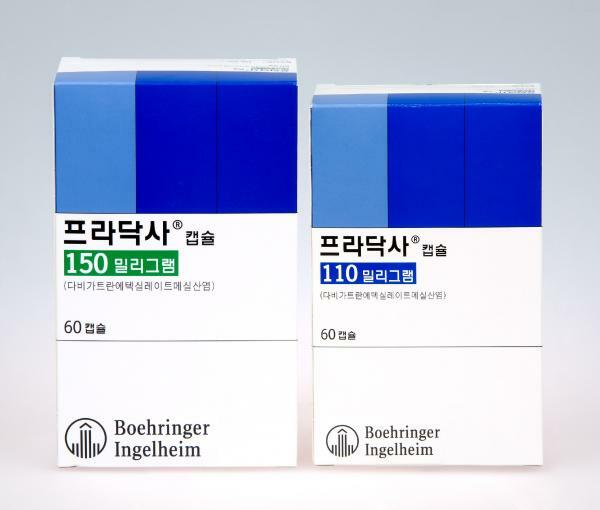 110mg, 150mg, and Boryung Pharmaceutical’s Boryung Dabigatran Cap. 110mg, 150mg.